My time at University was as much about establishing Palermo as Italy’s dominant force on Football Manager 2012 than it was about scraping a 2:1 in History. Back then, I had so much free time on my hands that it felt rude not to delve into my Palermo save at any opportunity. But since becoming an actual adult with responsibilities, it has become increasingly difficult to devote my time to playing FM. Despite getting my hands on FM18 over a month ago, I’ve only amassed, one day, 10 hours and 47 minutes playing time with Southampton, achieving a frankly embarrassing rating of ‘mildly addicted’. While it may become harder to spend hours on end playing FM these days there are ways you can speed up the game and still enjoy it just as much (honest). With that in mind, here’s a guide to streamlining a season. 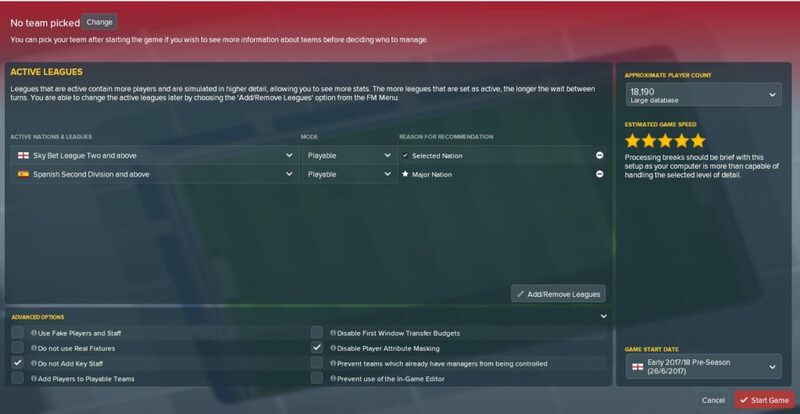 There are a lot of FM players who like to take control of everything they possibly can at a club (we called you guys Neurotic in this article, sorry about that). However, this is a really time-consuming way of going about things. A way to cut time drastically is to employ a strong backroom staff whom you trust to go about their jobs efficiently and effectively. Rather than taking training yourself, entrust your assistant manager to do so instead and get either your head of youth development or a youth team manager to run sessions for the younger age groups. 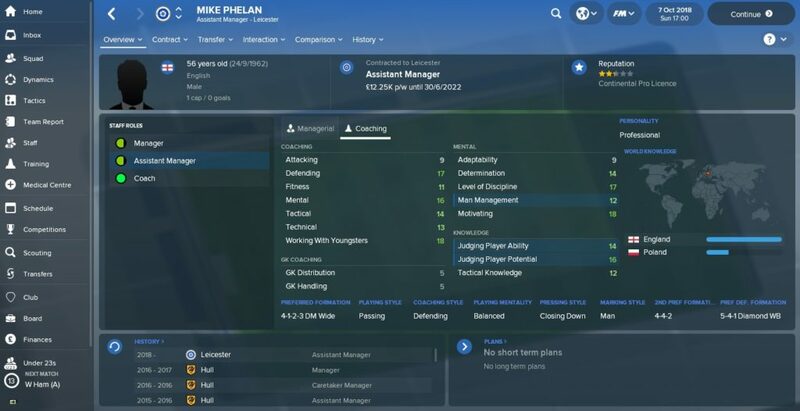 Mike Phelan’s turned up at Leicester on my save. Born to assist. When it comes to scouting, hire a highly-qualified Director of Football to set scouting assignments and ensure that your scouting department is full (and multi-national) to maximise the chance of finding good players. 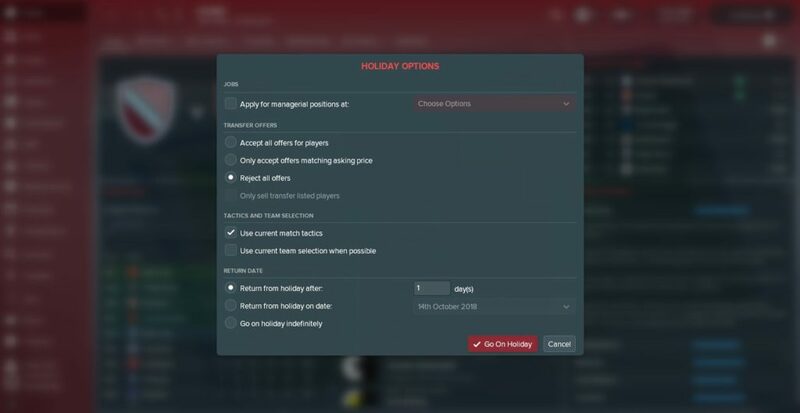 Depending on just how much you wish to streamline your save, you could even leave transfer and contract negotiations solely up to your Director of Football, allowing you to concentrate fully on matches. And if you’re feeling really lazy, just send your assistant to every press conference possible. Just like Sir Alex used to do with poor old Mike Phelan. 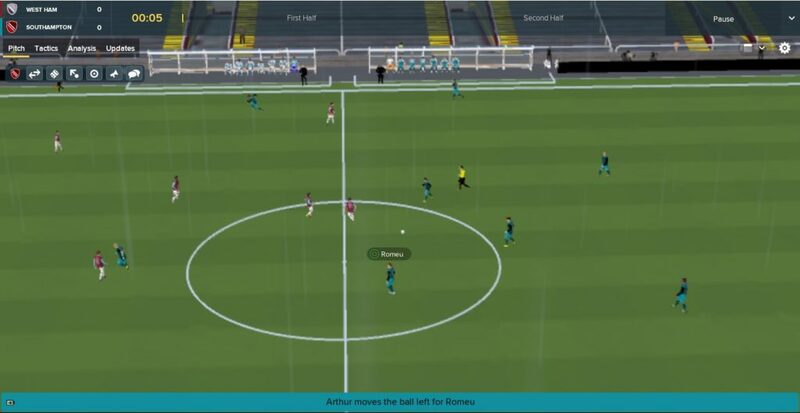 AI opposition managers are becoming increasingly smarter on every new Football Manager meaning you have to keep on top of your tactics in order to beat them. Rather than chopping and changing the way your team plays midway through the season, though, you should set up three different systems with set team instructions right at the start. This will take a bit of time at the beginning, but in the long run it will save you a lot of hassle. With your assistant taking charge of training, the players should become accustomed to playing in different formations before long. Recognising what philosophy you want your team to play with is important. Analyse what kind of squad you’ve inherited and make a judgement on what formations and style will suit them right at the start. For example, if you inherit Pep’s carefully crafted Man City squad, look to create three tactics with an emphasis on controlling the play through possession, rather than hoofing it to the strikers. It’s always tempting to select as many leagues and load up as many divisions as possible when starting a new save, with the risk of sending your laptop into meltdown. Obviously, the more players loaded on a database, the higher your pool of transfer targets will be. However, if you want to zoom through your game, take on a smaller database instead. By selecting fewer playable leagues and having a smaller database, you’ll be able to race through the game far more quickly. If you decide to manage in England, loading up the top five divisions with a large database should (unless you’re using an antique computer) give you a five-star game speed. That is plenty, but realistically any estimated game speed over 3.5 stars will be ample to get you through the game rapidly. Another useful hack is to head to ‘Detail Level’ and flick competition levels from default to minimum. Now to the matches themselves, which can take an absolute age to get through. There are plenty of ways in which you can alter games so that they whizz by a lot quicker, including in the preferences tab and in the actual game itself. This year’s match graphics really are great and the addition of warm-ups, players coming out of the tunnel and overall stadium improvements, have all been really well done. However, if you want to disregard all the work Sports Interactive have put into improving match graphics, it’s pretty easy to do so. Just go to preferences and alter the graphics quality to very low. FM18: Just a bit blurrier. It might look like you’re watching the game through thick-rimmed specs but it will make matches go quicker. Another way of streamlining the match is to only watch ‘key highlights’ and to scrap replays altogether. This is actually a pretty fun way of watching the action unfold as virtually every highlight will be a big moment in the game; be it a goal, red card, penalty or outrageously bad miss from your new £30m striker. Admittedly, this is highly controversial, and if you stop reading right now we can’t entirely blame you. But hear us out. Going on holiday for a week or two in-game can really speed up the whole process. Leave the team in the hands of your (hopefully) capable assistant and get some much needed R&R. Even the best managers in the history of the game switched off for a week or two, heading off to the Canary Islands to have a few cocktails by the hotel swimming pool. Now obviously, you have to pick and choose carefully the optimum time to swan off from the club for a while. If you’ve got an FA Cup semi-final or local derby coming up, it’s probably best to stay put. However, if there’s a major international tournament going on and you don’t have any matches scheduled, then what’s the harm in going away for a bit? Just make sure you select ‘Reject all transfer offers’ as an option so that when you return your squad is pretty much how you left it.